NEW DELHI: DLF Shopping Malls, the country’s biggest and largest physical market place today announced the launch of India’s first ever retail Phygital application ‘Lukout’. The initiative is part of the brand’s New Retail journey to redefine the shopping experience in India. With the launch of Lukout, DLF Shopping Malls will enter a new realm of digitization, thereby strengthen its foothold in new cutting-edge technologies and retail solutions. This will empower DLF’s vision to reengineer the very definition of ‘New Retail’ experience, diminishing the boundaries between online and offline retail world. The Lukout app is a one stop solution that offers highly personalized proximity based engaging content in terms of latest looks, latest trends, real time location based offers while providing conveniences like One touch Parking payment, one touch valet, one touch concierge along with having its own social network for millions of consumers. For Retailers, the app provides a disruptive platform to enable channel-based consumer targeting and further allow brands to host their virtual stores fronts on Lukout to enhance discoverability & device proximity campaigns to target consumers via big-data powered analytics dashboards. DLF Shopping Malls has been focusing on strategic partnerships and has gravitated this approach to become first movers in the industry to enable seamless integration of the online and offline shopping culture in the country, which is christened as The New Retail Phygital era. Some of these partnerships include – Global e-commerce and technology giant, Alibaba Could for providing big data, artificial intelligence and high-powered computing capabilities and Firefly (a JV of Airtel & Vodafone) for providing ‘We Connect’ – one of country’s best in-mall Wi-Fi experience compliant under the most recent future ready GDPR regulations. 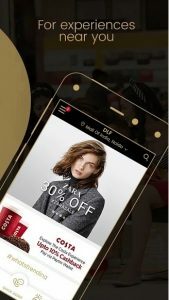 In addition to this, the brand has also partnered with the German IOT major Minodes – a Telephonica Next company to deploy big- data powered deep consumer analytics across all the retail properties of DLF Shopping Malls, building data rich analytics for highly granular user behavior, heat maps, dwell times, life time repeats & real time in-store conversions. To realize a unified interconnected ecosystem for retailers & consumers, DLF Shopping Malls has associated with Hogarth WorldWide to develop the first ever Phygital application ‘Lukout’ for providing real time personalized hyper-local experiences for its millions of consumers. Pushpa Bector, EVP and Head, DLF Shopping Malls, said, “At DLF Shopping Malls we are constantly innovating to meet and exceed the expectations of the evolved consumer. We have pioneered and embarked upon our ‘New Retail’ journey based on the premise of our Phygital strategy, spearheaded by our endeavors of collaborating with strategic partners. This initiative will be instrumental in creating new benchmarks for Indian retail industry while offering unprecedented experience for our consumers”. Harshavardhan Chauhan, Head, Central Marketing & Phygital, DLF Shopping Malls said, “We are excited to launch the industry’s first ever Phygital product, leveraging on cutting edge technology across IOT, big-data, real time analytics & proximity personalized marketing to realize our New Retail vision for seamlessly connecting the physical & digital ecosystems. Lukout will empower India’s top brands across DLF Shopping Malls to embark this New Retail journey while enabling us to disrupt experiences for millions of our consumers as part of our phygital strategy”.